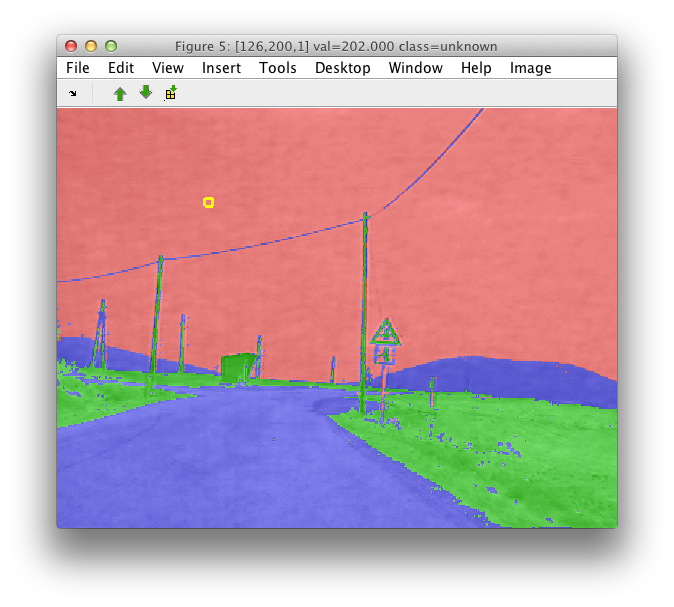 perClass provides a set of tools for working with image data. 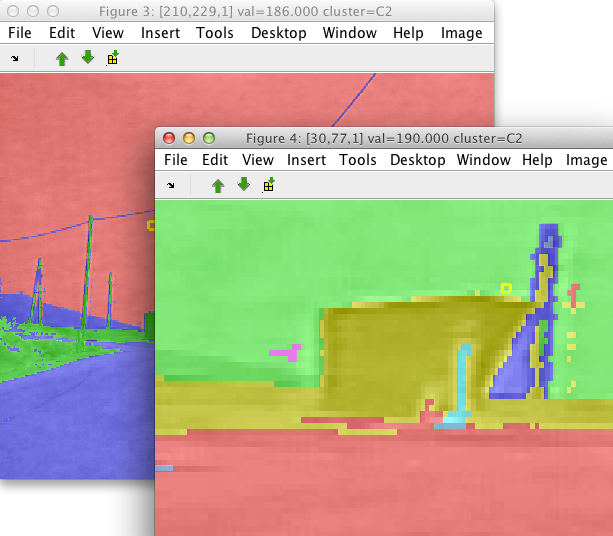 It allows us to visualize gray-level or multi-band images, compute local image features and identify connected components. Starting with perClass 4, this functionality is available as "Imaging option" (see sdversion for available options). 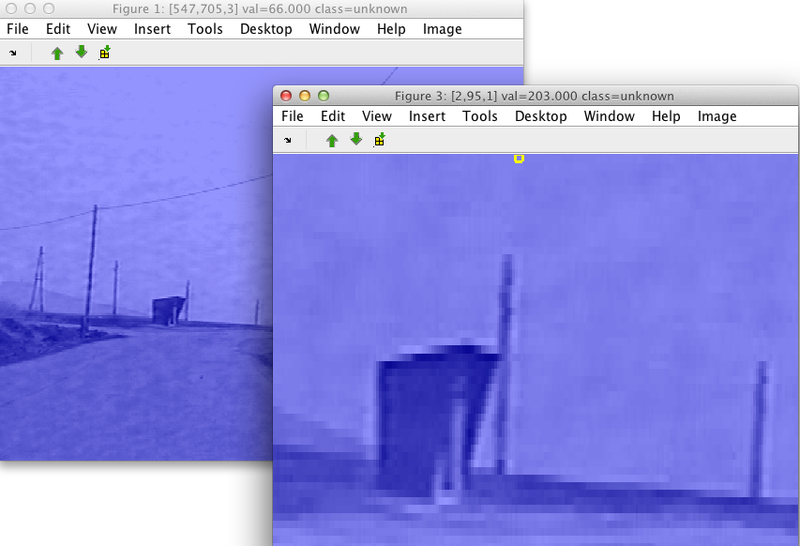 The blue layer on top of the image represents the set of labels of the image data set, internally used by sdimage. As any other sddata set, each sample (pixel) has a label, which is set to "unknown" by default. We may toggle this label layer using the space bar key. Additionally, we may also adjust label transparency from very transparent to opaque in the Image menu. The objects a and b are standard sddata sets with one sample for each pixel and three features corresponding to R,G, and B bands respectively. Note, that the pixel values were also converted into double precision. A dialog window will ask for the name of the class. 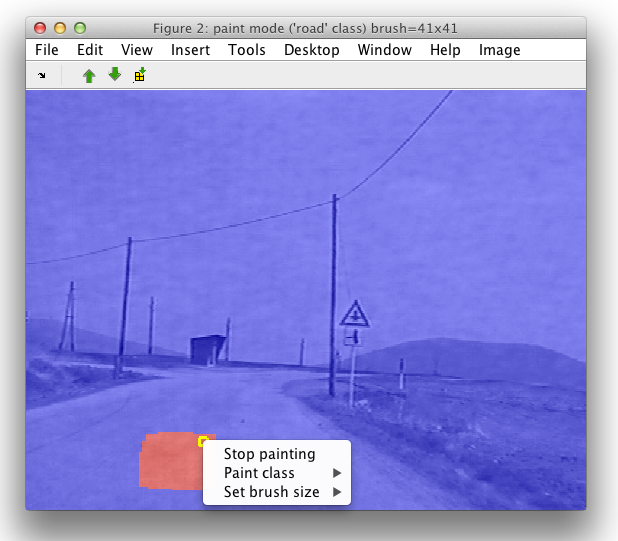 Let's say we are interested in labeling the road, we provide the name of the class and paint in the image region. Via the Image menu, or by clicking the right mouse button we can change brush size or exit from the paint mode. Often, we only want to work with a smaller area of a large image. sdimage offers us a crop function which makes this very quick. Select the Crop image item in the Image menu. A cross-hair will appear. Choose two corners of a region you wish to crop. The process may be terminated by clicking right mouse button. >> Creating data set c in the workspace. The Create data set in workspace command in Image menu lets us to store the image data together with the painted labels in a new sddata object in the Matlab workspace. We are asked to provide the variable name for this new data set. The image data sets preserve the image information. We may, for example, use only a subset of data, e.g. 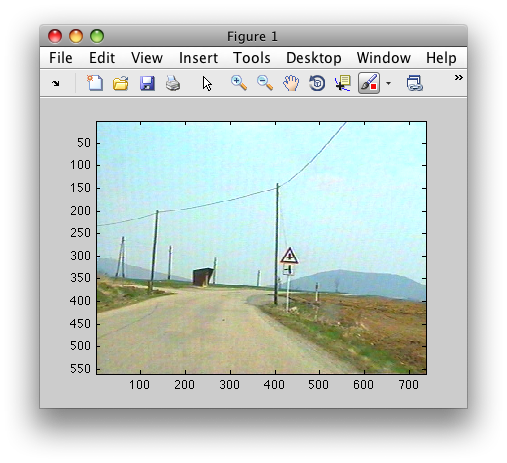 the pixels labeled as 'road' in the data2 object above. Matrix I is created with the size of the original image the sub data was extracted from. The matrix is filled with zeros and only the pixels available in the sub data set are inserted into this matrix. Image data sets created from multiple images may be joined. This feature allows us to create larger training sets with pixel-level data from multiple images and train robust classifiers. 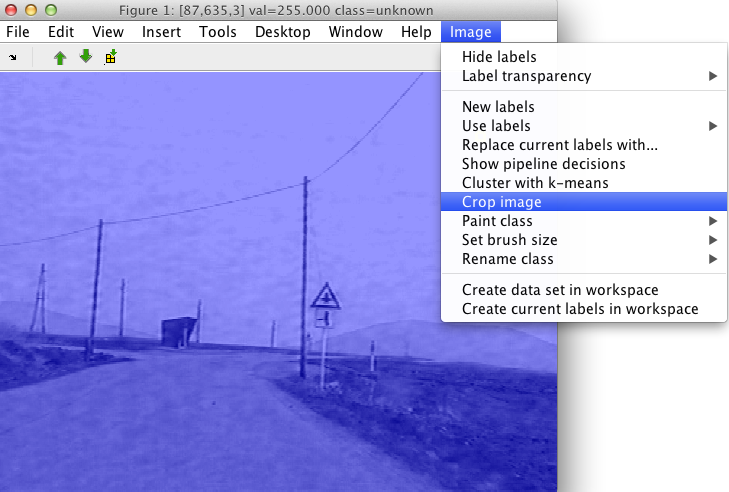 Each image data set, created using sdimage, contains 'image' property (labels). If the image is loaded by providing the filename, this will be used as its image label. 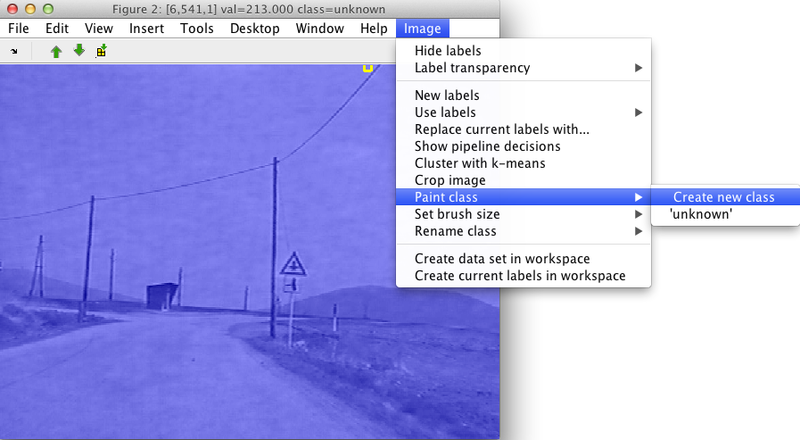 If we create an image from a matrix, sdimage creates random image label to avoid name clash with other images. Note, that the image name is generated randomly and no check for identical names when concatenating image data sets is performed. It is the responsibility of the user to make sure that different images in one data set are labeled differently. 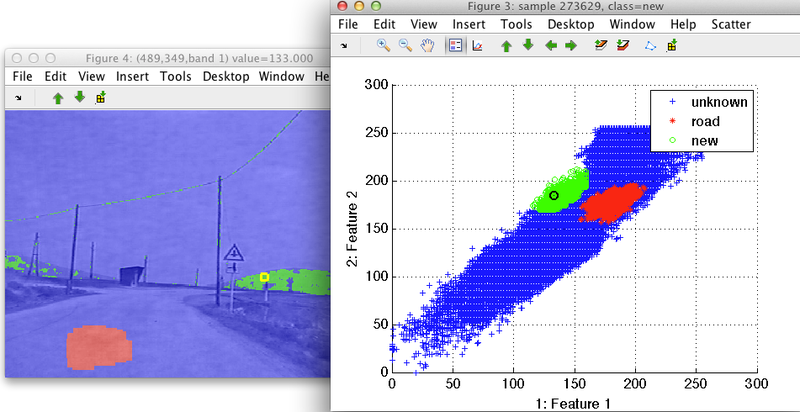 It is often useful to inspect the connection between image neighborhoods and the scatter plot. 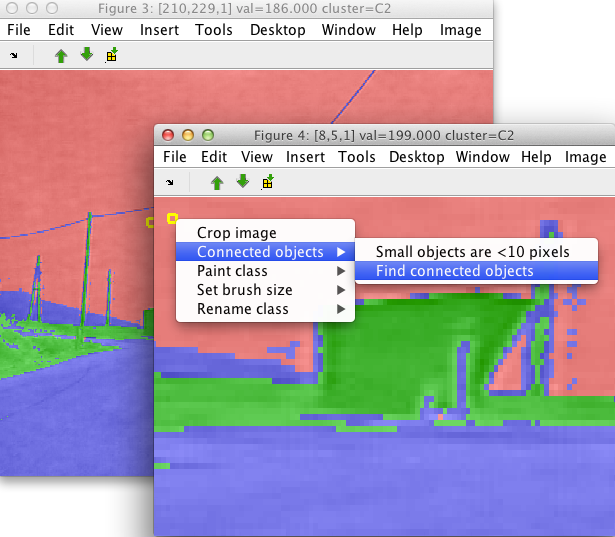 In order to visualize this connection the sdscatter and sdimage commands can be used together. We may simply show data set with image data using sdscatter and then connect the sdimage plot to the scatter figure using the returned figure handle. >> data2    %  Created data set data2 in the workspace. 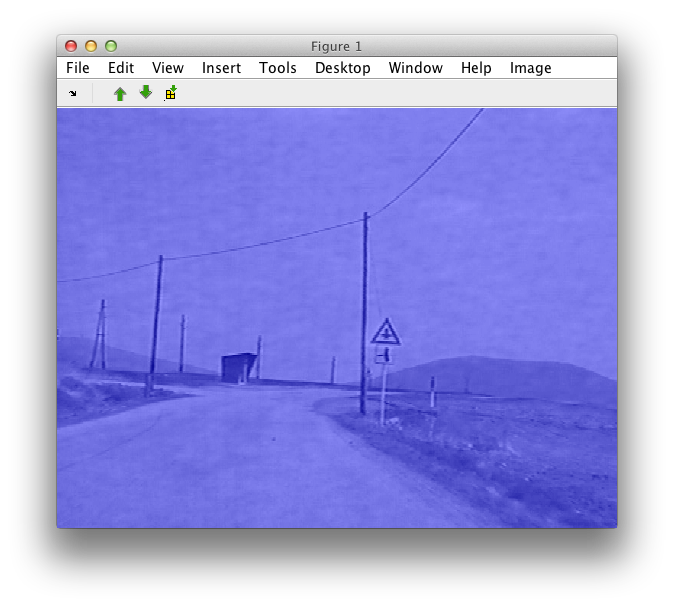 By moving the mouse pointer over the image, we see where the image pixel appears in the feature space. 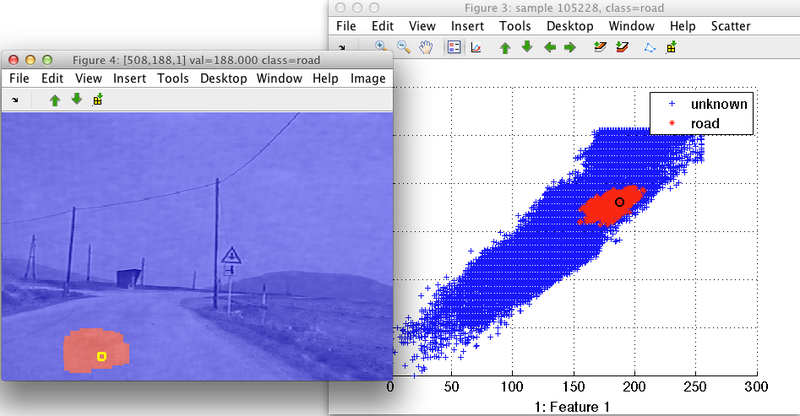 Similarly, moving over the scatter plot shows us the corresponding pixel in the image. One way to quickly group image data is to perform clustering. 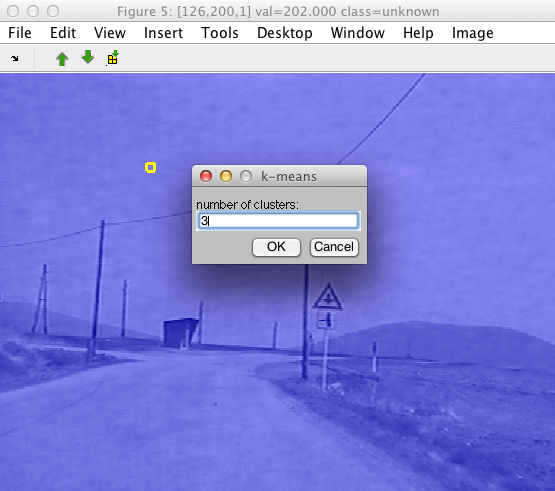 Using the Cluster with k-means command in Image menu, the data set underlying our image is clustered. The algorithm considers individual pixels as separate data samples and image bands as features. We are prompted for the desired number of clusters. We will obtain a new set of image labels called 'cluster' containing classes called 'C1','C2' etc. Typical next step is to interpret the clusters. This may be done by assigning meaningful names using the Rename class command. sdimage allows us to define spatially-connected components. This allows us to quickly access individual objects or regions in an image data set. The Connected components menu is available only if the current set of labels contains two or more classes. Connected component command processes the current set of labels. For each class, the connected components are found separately. Small isolated components are joined together into a special class (called 'small objects'). This helps us to quickly remove the noise. 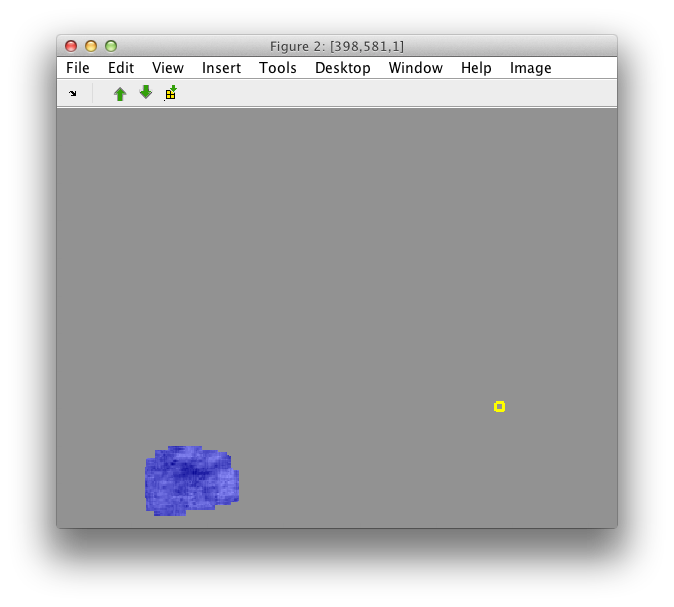 By default, objects smaller than 10 pixels are removed. This can be changed by the first item in the Connected components menu. In order to separate all isolated objects, use the value of 1.